57in52 – The story of how to get to a lifetime total of 250 marathons by the end of 2017. The story of how to get to a lifetime total of 250 marathons by the end of 2017. #61 this year and #254 in total, Bovington tank. This day really belongs to Tara Rufus, who became the newest member of the 100 club today and the third Quantock harrier to achieve that accolade. Tara specialises in picking ridiculously tough events, and running alongside people at the wrong end of the field, helping them get home safely. Oh and she’s a big white star running fan too which is why I had to stay in the Poole travelodge last night, and get my sorry self to the start line this morning, along with Jane, and aided as ever by Karen and John. This was probably a marathon too far for me. I’m full of cold, I’ve completely lost a toe nail, I’ve strained my left leg, and I’ve hurt my lower back, so a hilly run through streams and along tank tracks was just what I needed. But you know me. Stiff upper lip, never complain hey? 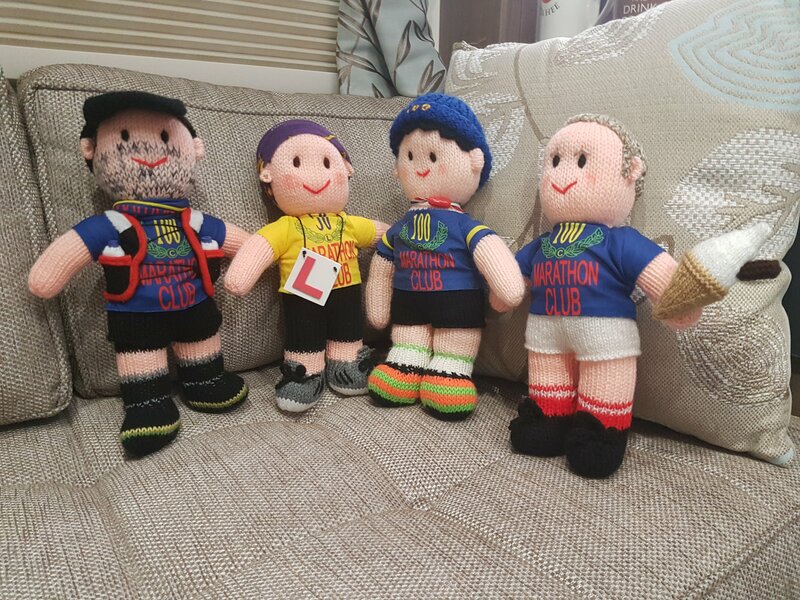 Ran with lots of my best buddies today which really made the day special, and no fewer than 5 of karen’s mini me dolls were put out to new families, bringing an incredible amount of joy and happiness to people. I should have been running the Portsmouth coastal marathon in the morning, to celebrate with Jim Whitmarsh as he knocks off his 200th marathon. I’m going to be a DNS however. This old carthorse needs time to recuperate in the stable before venturing out again in 2018. I’m presently on 48 parkruns and so my final target is to get to 50 before the year closes. So this will be my final blog entry. Thank you to all those who have shared the journey with me and offered kind comments. You will have to find fresh reading material for next year!! The usual 5.00 get up for a 7.00 start to avoid the worst heat of the day. Karen as ever nurse maiding me to the start line. Randomly met Sarah, that I used to work with at Debs during registration yesterday, along with her two friends Clare and Dorothy. As they were staying some distance from the start line we let them use our hotel room as a bag drop. Not sure what the hotel staff made of me and four ladies leaving our hotel room at 6.45 this morning! The first lap was hard. Diabetes plays with your emotions sometimes and I was fed up, down in the dumps and most things hurt. I cheered up when I completed the first lap in just over 2 hours though, and gave myself a kick up the proverbial and ran well till mile 17 when the heat of the day really kicked in along a long empty lonely stretch of sea wall. I met a friendly German guy from the German hundred club and we shared a chat and a photograph and agreed a sub 5 strategy and getting home safely was the thing to do. (Also met two hundred clubbers, Steve P and a girl I didn’t know). The last 9 miles we’re back in to the Havana town centre. Lots of pollution and noise from the beautiful old vehicles but we were prioritised well through lots of traffic and road junctions by a mix of army guys, police and stewards. I have to say the whole thing went off much better than I had feared. The route was on road surfaces that at home we would say were fine, apart from a couple of miles, there was loads of water and ice and fruit juice, I felt safe and looked after all around, and while it was more a case of running past friendly passers by rather than being cheered on by supporters, the organisation was great. Dave, Anne and Karen saw me finish, and as I left the repatriation zone I was met by youths looking for running gear (which I had expected). There’s very little they can get in Cuba. So I happily gave away my only running hat that I’d got in New Zealand (sob), and two pairs of shoes I’d brought over in anticipation. Big sense of relief as I write this now where’s my Cerveza??? Well that was fun! The 100 club has a little known pursuit called the 50 county badge. The ‘official’ list of counties is quite old and includes all of Ireland, and I think also middle earth. There’s very few people have got the badge, probably Brian Mills, Steve Edwards, Traviss, Gandalf and Bilbo. But today I ticked off my 50th county. Rather symmetrically for a Yorkshireman, I earned it in Lancashire, on the hell of a hill run up Rivington Pike, which some hardy types are doing as a 5 day running challenge. I travelled up last night and stayed in a soulless travelodge, but at 9.00 I was on the start line with Steve Jackson, another pensioner on a day trip, who is edging ever closer to reaching 300 marathons by the end of this calendar year. We shared a cold crisp day, with frost on the cars to begin with. The sun was lovely when it came out, and the views from the top of the hill were far reaching. However, after 5 loops and 4000 feet of ascent, I was happy to turn for home and enjoy the snail trail that is known as the M6/M5. That’s me done now till Havana in 10 days time. Also good to see Cohen, Pascal and Chantelle, our French running buddies. Those guys certainly put some miles in ! There’s some classy marathons on offer this weekend, Herepath, Snowdon and Dublin to name but three, but for the 6th time, I went with Dartmoor vale. It’s road, some of the roads are ‘orrible, but the best bits, from Chudleigh to Newton Abbot in the autumn sunshine are beautiful. What makes it is the rotary club marshalls. There’s loads of them. Without being impolite I don’t think many of them have ever run, let alone run a marathon, but they are fun, friendly, generous people who raise a good few ££ for charity. Got around nicely in just under 5 hours which I thought was a good effort, but having checked the results I’m miles down the field! Just the one picture today, taken while Jerome and I were in the toilet queue. You can see the look of envy in his eyes….. Finally done it! I needed a challenge when I left Debenhams nearly 12 months ago and to run 57 marathons in 2017 to get to a lifetime total of 250 by the end of 2017 is what I chose, and today I knocked it off!!! I have had a fantastic year. I’ve run 52 in 52 weeks, done 100 in 100 weeks, run 10 in 10 weeks, 4 in 4 twice, a triple and numerous doubles. I’ve run in New Zealand, Ireland and England and will soon run in Cuba. What I’ve learned is less is more. I think in 2018 I’ll settle back to 30 a year and not chase numbers. That might work for some but running is part of life, not all of life for me. Today was hellishly tough. A nine hours plus marathon on a really technical, treacherous, slippery trail. Mel said she felt like Bambi on roller skates on ice, and that puts it well. The 3 day event had 200 starters and i think there were about 150 finishers, with me at #105, but really it’s about the camaraderie, the fun, the shared experiences, the falls and the bruises. Special mention to Lizzie and Jan who came down all the way from Hull for this nonsense, and to Karen who issued out 3 more mini me dolls, and to Jane and John our running soul mates. Sorry if this blog is a bit of an Oscar speech valedictory but I think I’ve just hit my running high watermark and it’s all down hill after this!! Tough tough day today. No Jane as she had to go for an elbow x-ray at Truth (all clear Maryon!!). So I ran most of the day alone, behind Lizzie, Steve, Jim and Janet. The first half of the course was rocky narrow paths with lots of river valleys with steep ascents and descents. The second half opened out a lot and was easier running till we hit the dunes and the eternal beach heading in to hayle. The weather as predicted has been shocking. Even with the best gear it’s taken a good bit of mental fortitude to slog through it. #55, Atlantic coastal challenge, day 1. All the gear but no idea..
One of those days when God is in heaven and bestows a gift upon us. Gorgeous sunshine, little wind and the Cornish coast from Trevose head southwards to Perranporth at it’s October autumnal best. Jane and I set off in the early group with Lizzie Steve and Jim, and we were on the trail by 8.45. The black cafe support crew were supplemented by Lizzies mum Janet and within the first 300 yards we had lost sight of Lizzie, who flew around taking well over an hour off her time last year. Jim and Steve drew away from us but then we caught them up due to some dubious navigation on our part as we entered Newquay, but they soon pulled away again once we left town and found our way safely over the tricky Gannel river crossing. Excellent company the pair of them. If a bit rude. And a little disrespectful. And occasionally sarcastic. But apart from all that, and their cynicism and cheek and undeserved put downs it was good to share a few miles with them. Things went a bit wobbly in the second half. 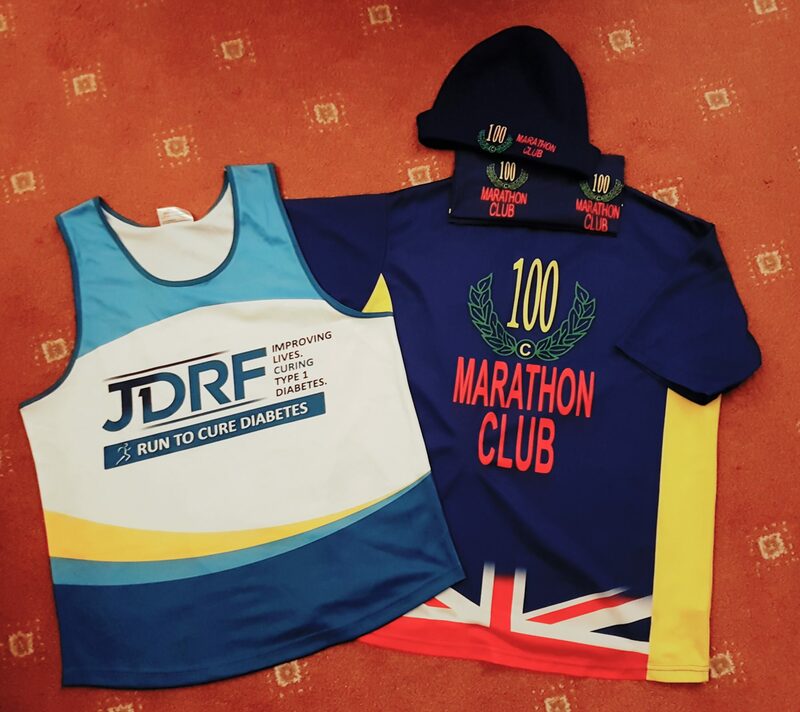 I started running out of energy and travelling slowly, – the usual combination of diabetic rubbish and simply too many marathons this year, and then Jane fell over. On granite, spectacularly, comprehensively. A complete mess. Fortunately the lady walker we had just overtaken was a retired ambulance worker and within ten minutes jane was vertical and running again. Then I fell over. On sand, less spectacularly, everything covered in sand. A further delay to deliver a few expletives to passing seagulls and then we staggered and limped home like two returning veterans from Custers last stand. The morning run will be fun. Heavy rain and high headwinds so it will be very different from today. Still, what a privilege to be able to run on a day like today. Carpe diem friends! !